Rudolf Steiner's work is recognized today largely due to the prominence of the international Steiner school movement, biodynamic agriculture, anthroposophical (holistic) medicine, and so on. However, the comprehensive spiritual philosophy that stands behind these practical initiatives is not so well known. In this concise presentation, based on years of giving introductory courses on the subject, van Oort presents an overview of key aspects of Steiner's thought. He deals with concepts such as body, soul and spirit, the relationship between man and animal, and the evolution of consciousness. The latter subject opens up panoramic vistas of human development in the form of successive cultural periods extending over thousands of years. 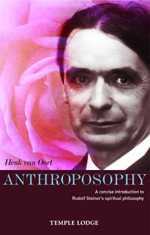 HENK VAN OORT, born in 1943, trained as a primary teacher before taking a Masters degree in English at the Amsterdam University. He has taught for 40 years in primary and secondary education, including class teaching in a Steiner school, teaching English, and running educational courses and seminars for teachers and parents. His interest in literature and poetry has led to his appearance at storytelling and poetry seminars, and his introductory courses to anthroposophy have proved to be highly successful. Based in Bergen N.H. in the Netherlands, Henk van Oort is married and the father of three grown-up children.